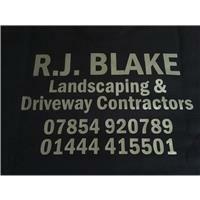 R J Blake Landscaping & Driveway Contractors - Builder, Driveways/Patios/Paths based in Haywards Heath, West Sussex. Hi, I am a local building and landscaping company founded in 2002. I have been in the building trade since 1995 but didn't start out on my own until 2002. We are starting to establish ourselves in the building & landscaping trade. We carry out all types of basic landscaping building work. Garden Maintenance, Hedge Cutting, Lawn Mowing, Strumming, Planting Tree Work, Shaping & Pruning, Turfing, Decking, Ponds, all types of Fencing & Gates, Patios, Paths, Driveways, Shed Bases, Garden Design Brick & Block Work, Lead Work, Repointing, Drainage, Fascia & Soffit Guttering ,Renovations, Alteration, All types of Carpentry Work, Painting & Decorating, Plaster Boarding. We also fit Summer Houses, Sheds Stables, Windows, Kitchens & Bathrooms. Will beat any genuine quotations.